Axiomatic Technologies Corporation | Understand. Innovate. Solve. 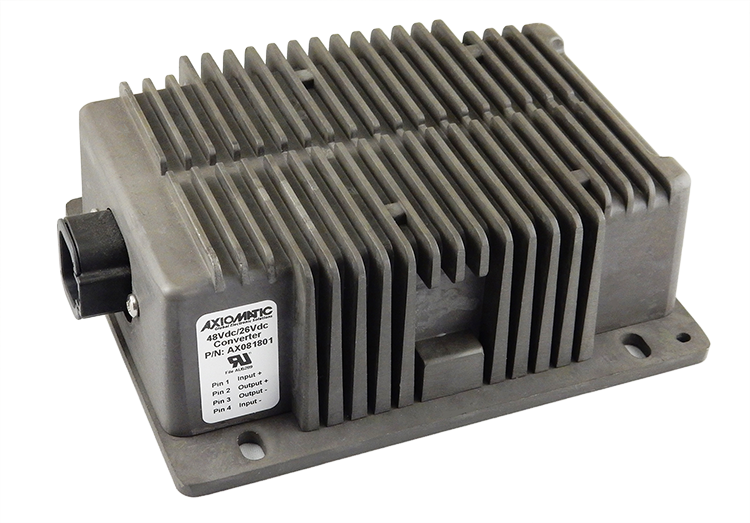 Electronic controls and power converters for rugged applications. CAN bus control design. Dc/Dc power converter design. Controls manufacturing. Products include: battery charger, valve controllers, solenoid driver, electro hydraulic controllers, dc dc converters, power supplies, power converters, current converters, signal converter, voltage converter, PWM converters, pwm controller, industrial fieldbus controls, CANbus, CANopen, SAE J1939, PID controller, LVDT simulator, soft shift controllers, speed controls, machine automation, engine temperature monitoring controls, control products, off-highway equipment controls, amplifiers and control systems for hydraulic or pneumatic valves, dc motor controls for electric vehicles, transmission controller, hydraulic fan controls, electric fan drive systems, closed loop controls, gyroscope, tilt sensors, inclinometers, angle measurement, laser receiver, valve driver, pwm converter, motor controller, transient surge suppressors, programmable controls, rs-485 converters, distributed controls, BLDC motor controls, signal conditioners, DC/DC power supplies, and software. 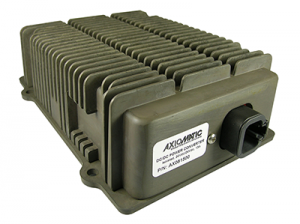 Axiomatic Technologies Corporation is a quality designer and manufacturer of electronic controllers and power management converters. Robust and reliable electronic controls optimize working machines for performance and emission control. Axiomatic focuses on innovative and efficient designs, quality ISO 9001:2008 manufacturing and cost-effective solutions. New control designs incorporate the latest in component technology and software programming. Our flexible architecture allows the user to source factory programmed controllers to meet their application needs. User configuration with the Axiomatic Electronic Assistant® allows the machine designer to calibrate SAE J1939 CAN controls for multiple applications. Controls are rigorously tested for functionality, EMC compliance, vibration and environmental performance for reliable operation in the harsh environments experienced by construction, mining and on-highway machines. Our electronic valve controllers, I/O, DC-DC power converters, motor controls and battery charger are installed in a variety of OEM equipment worldwide. Click here to view our list of product applications. Download our Electronic Controls Overview brochure. Contact our application and sales staff to discuss your requirements at sales@axiomatic.com. 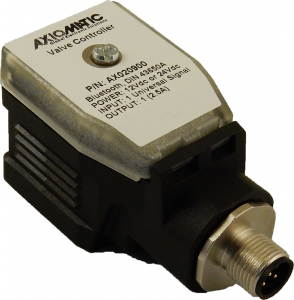 Axiomatic now offers a Triaxial Gyroscope for moving machines. Part of a growing family of inclinometers for machine control, the AX060900 and AX060910 measure pitch and roll inclination angles in a full ±180-degree orientation range. The angles can be compensated by a 3D gyroscope to minimize the influence of dynamic linear accelerations caused by vibrations and machine operational movements. The units can also output: gravity angle; pitch, roll and yaw angular rates; and unit accelerations in three orthogonal directions. The inclinometers transmit angular data over CAN bus using a standard J1939 protocol. Model AX060910 offers greater shock resistance. 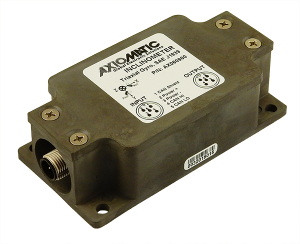 Axiomatic also offers triaxial inclinometers, tilt sensors, ethernet switches, CAN/Ethernet gateways, a rugged display and laser receiver for machine control applications. 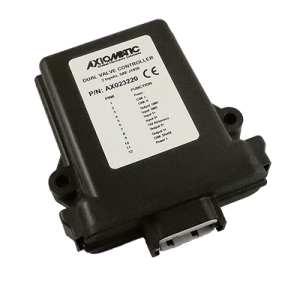 Axiomatic releases a CANbus (SAE J1939 or CANopen) connected Single Valve Controller with DIN 43650A mounting style. 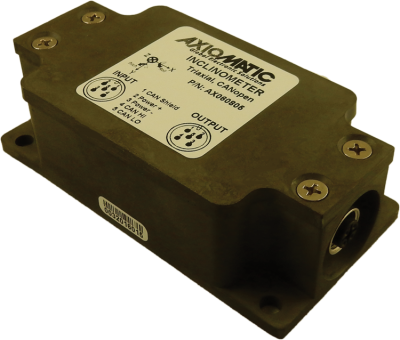 Axiomatic releases a 12V or 24V Hot Shot Solenoid Protection Controller, Plug-In style mounting for machine applications. 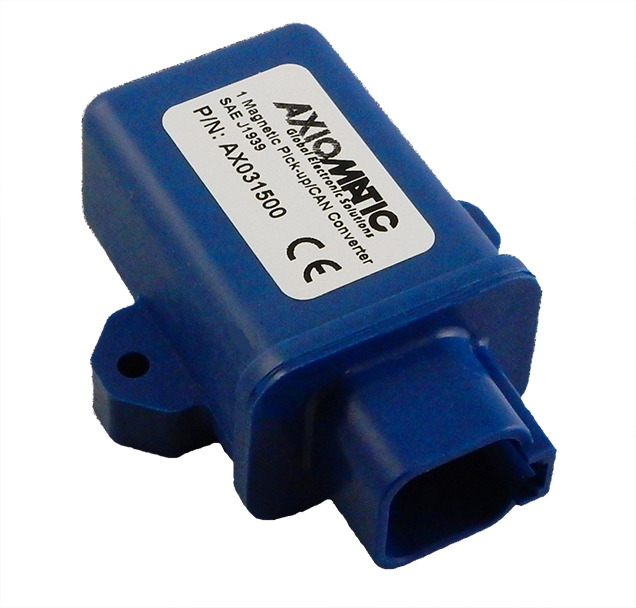 Axiomatic releases a Bluetooth capable Single Valve Controller, DIN 43650A mounting style as part of its connectivity program. 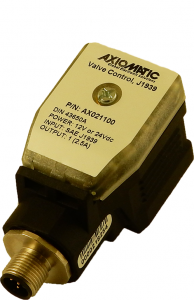 The Valve Controller, AX020900 is configurable via Bluetooth with the Axiomatic CAN2BT smartphone application for Android phones. 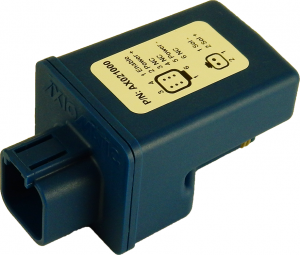 It has a high frequency switching output (PWM) to drive one solenoid up to 2.5A. It accepts one current, voltage, PWM, frequency or digital signal input for interface with sensors, joysticks or switches. Designed for machine applications, it is vibration compliant, rated to IP67 and operates from -30 to +85°C. An LED indicator provides status of operation and the M12 connector simplifies wiring. 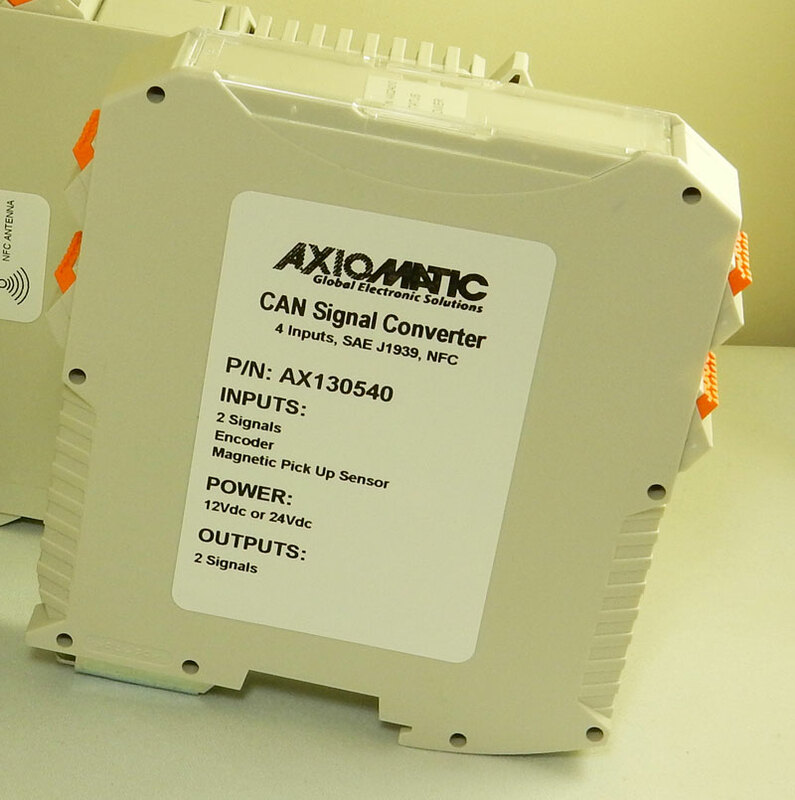 Other Axiomatic connectivity products include the CAN/Ethernet Converter, the Ethernet Switch as well as the CANBluetooth and various NFC configurable controllers. 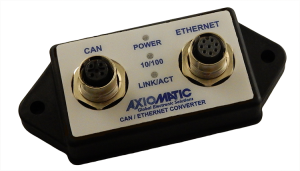 Axiomatic releases a CAN-Ethernet Support Package (SSP) for developing application software when working with the AX140900 CAN/Ethernet Converter. The converter contains a web server to setup configuration parameters and monitor the internal state of the converter using a web browser. 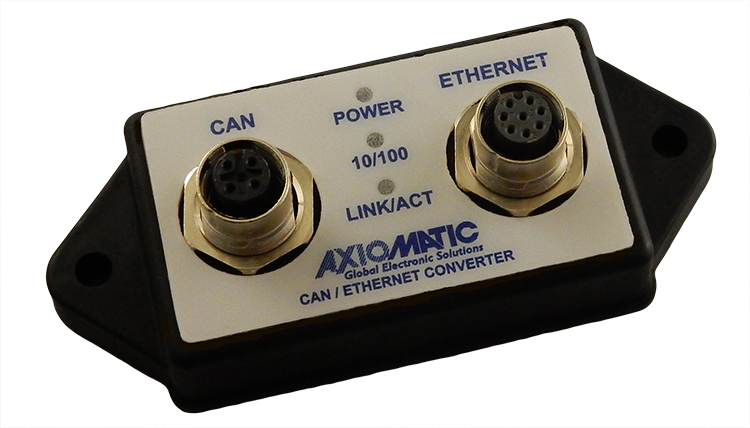 The user can remotely monitor and configure Axiomatic CAN-based controllers over the internet using the AX140900 CANEthernet Converter together with the Axiomatic EA and CAN-Scope software. We call this service tool EA-Connect. Other Axiomatic connectivity products include the Ethernet Switch as well as the CAN-Bluetooth and CAN-Wifi converters. This new Dual Input, Dual Output Valve Controller (2i2o) is a high temperature controller for installation under the hood of a mobile machine. It has two fully configurable universal inputs and outputs. Inputs can be set up to read voltage, current, resistance, frequency, or digital command input signals. The outputs can be setup to drive proportional current, hotshot digital current, proportional voltage, proportional PWM and straight on/off digital loads. The product was developed with Simulink® providing sophisticated control algorithms that allow the user to program the controller for a wide range of applications without the need for custom software. It comes with 1 CAN port and is available in different models ranging from 250kpbs-1Mbps baud rates. It is suitable for harsh environments with rugged packaging and connectors. Manage 24Vdc battery power to sensitive electronic devices using the UL recognized and rugged Axiomatic AX081500 DC/DC Converter. See how you could join the Axiomatic team here. Read all Frequently Asked Questions here. Axiomatic Technologies attended the Intermat Construction Equipment Show from April 23-26, 2018 in Paris, France. Axiomatic Technologies will exhibit in Hall A2, Stand 449 at Bauma 2019 in Munich, Germany. Axiomatic Technologies will attend the IFPE 2020 show.